Here are some snazzy birthday facts about 11th of November 1987 that no one tells you about. Don’t wait a minute longer and jump in using the content links below. Average read time of 11 minutes. Enjoy! 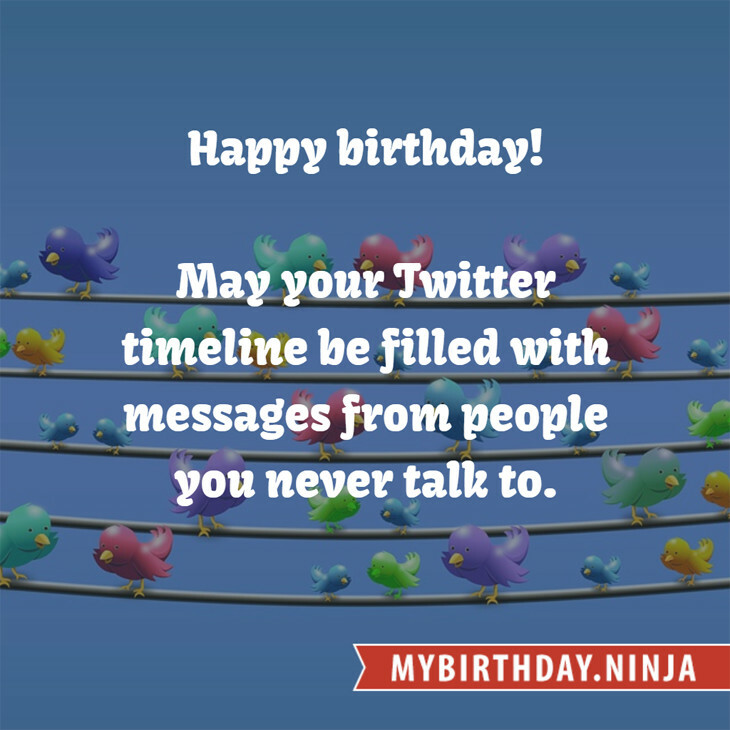 What day was my birthday Nov 11, 1987? November 11, 1987 was a Wednesday and it was the 315th day of the year 1987. It was the 45th Wednesday of that year. The next time you can reuse your old 1987 calendar will be in 2026. Both calendars will be exactly the same! This is assuming you are not interested in the dates for Easter and other irregular holidays that are based on a lunisolar calendar. There are 206 days left before your next birthday. You will be 32 years old when that day comes. There have been 11,482 days from the day you were born up to today. If you’ve been sleeping 8 hours daily since birth, then you have slept a total of 3,827 days or 10.48 years. You spent 33% of your life sleeping. Since night and day always follow each other, there were precisely 388 full moons after you were born up to this day. How many of them did you see? The next full moon that you can see will be on April 19 at 11:14:00 GMT – Friday. Fun stat: Your first one billion seconds (1,000,000,000) will happen sometime on July 20, 2019. If a dog named Meelo - a Treeing Walker Coonhound breed, was born on the same date as you then it will be 182 dog years old today. A dog’s first human year is equal to 15 dog years. Dogs age differently depending on breed and size. When you reach the age of 6 Meelo will be 45 dog years old. From that point forward a large-sized dog like Meelo will age 5-6 dog years for every human year. Second Battle of Khotyn in Ukraine: Polish–Lithuanian Commonwealth forces under the command of Jan Sobieski defeat the Ottoman army. In this battle, rockets made by Kazimierz Siemienowicz are successfully used. The F.H.C. Society, also known as the Flat Hat Club, is formed at Raleigh Tavern, Williamsburg, Virginia. It is the first college fraternity. The United States Numbered Highway System, including U.S. Route 66, is established. World War II: Battle of Taranto – The Royal Navy launches the first aircraft carrier strike in history, on the Italian fleet at Taranto. Vietnam War: In a propaganda ceremony in Phnom Penh, Cambodia, three American prisoners of war are released by the Viet Cong and turned over to “new left” antiwar activist Tom Hayden. The House of Lords Act is given Royal Assent, restricting membership of the British House of Lords by virtue of a hereditary peerage. What does my birthday November 11, 1987 mean? 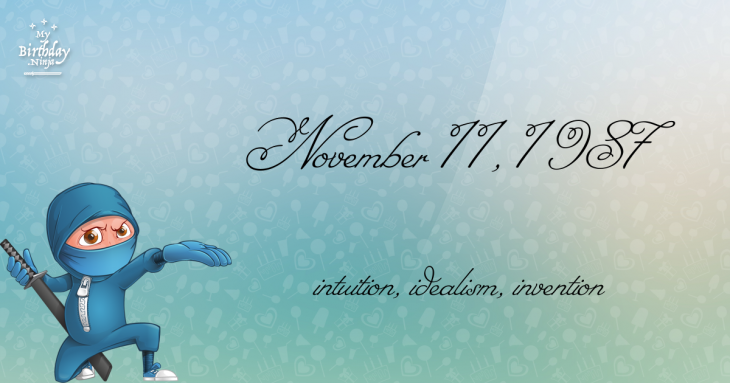 Your birthday numbers 11, 11, and 1987 reveal that your Life Path number is 11. It is a master number that represents intuition, idealism and invention. You have the potential to be a source of inspiration and illumination for people. The following celebrities also have the same life path number: Jim Brown, Zohra Lampert, Patricia O'Callaghan, Vladimir Mayakovsky, Ali Lohan, Nilüfer Yumlu, Alan Hunter, Christina Grimmie, Kim Heechul, Zakk Wylde. What is the birthday horoscope for Nov 11, 1987? The Western zodiac or sun sign of a person born on November 11 is Scorpio ♏ (The Scorpion) – a fixed sign with Water as Western element. The ruling planet is Pluto – the planet of transformation. According to the ancient art of Chinese astrology (or Eastern zodiac), Rabbit is the mythical animal and Fire is the Eastern element of a person born on November 11, 1987. Fun fact: The birth flower for 11th November 1987 is Chrysanthemum for loveliness. What is the Love Match for Nov 11, 1987? When it comes to love and relationship, you are most compatible with a person born on February 10, 1986. You have a Love Match compatibility score of +156. Imagine being in love with your soul mate. On the negative side, you are most incompatible with a person born on May 27, 1968. Your incompatibility score is -101. You’ll be like a cat and a dog on a love-hate relationship. Arf-arf, I want to bite you. Meow-meow, stay away from me! The number-one hit song in the U.S. at the day of your birth was I Think We’re Alone Now by Tiffany as compiled by Billboard Hot 100 (November 14, 1987). Ask your parents if they know this popular song. How many babies were born on November 11, 1987? Base on the data published by the United Nations Population Division, an estimated 138,691,278 babies were born throughout the world in the year 1987. The estimated number of babies born on 11th November 1987 is 379,976. That’s equivalent to 264 babies every minute. Try to imagine if all of them are crying at the same time. What is the popular baby name on 11 Nov 1987? Here’s a quick list of all the fun birthday facts about November 11, 1987. Celebrities, famous birthdays, historical events, and past life were excluded. Try another birth date of someone you know or try the birthday of these celebrities: June 26, 1984 – Gabrielle Walcott, Trinidadian model, actress, and singer, Miss Trinidad & Tobago Universe 2011; July 14, 1989 – Sean Flynn, American actor; March 19, 1932 – Gail Kobe, American actress and producer (d. 2013).